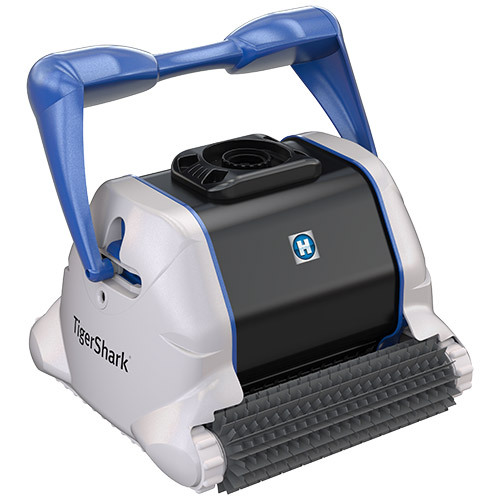 The Hayward TigerShark robotic pool cleaner is equipped with intelligent microprocessor-based technology. Because of this state of the art technoloy, the TigerShark makes sure virtually every area of your pool gets that much cleaner, and fast! The TigerShark has a 3-hour complete cleaning cycle for full floor, walls, coves and waterline. Its 24-volt motor uses less energy than a standard suction cleaner. With its easy use cartridge cleaning system, your pool will be cleaned fast and efficiently. There are no extra hoses, hookups or booster pumps needed to operate the cleaner.